Alright, so spring semester has started. You should have returned to campus relaxed, refreshed and maybe a few pounds heavier from consuming loads of Mom’s holiday cooking. You should totally be ready to take on your next set of courses, fresh new notebook in hand. You should definitely not already be chomping at the bit for spring break ideas. But you totally are, aren’t you? Don’t worry: We won’t tell. In fact, we’re gonna help you out. If your midlecture daydreams are suddenly filled with bikinis, beaches and beer (or something stronger), you might already be eyeing that all-inclusive package for Cancun, Mexico, or the Bahamas. But, this just in: International travel is expensive, even if you find one of those nifty all-inclusive packages. I played around with a hypothetical five-night trip for five to Mexico that StudentCity offers. Prices started at $1,472 per person from my ideal originating airport in Jacksonville, Florida, although the price would drop to $1,264 if I left from Orlando, Florida. But although the site promises “beach parties every day,” it makes no mention of food, booze or other spring break purchases. There’s always Groupon, of course, which regularly tempts me with lengthy all-inclusive trips to exotic destinations, sometimes starting at under $500. But when you read the fine print, you’ll see that those prices are usually based on double occupancy — that is, they’re aimed at couples, not groups of college kids. Plus, they’re often offered through tour companies which, while possibly awesome, tend to attract an older crowd. So what’s a beach-ready, book-fatigued upperclassman to do? First things first: Do NOT cash your financial aid check and spend it on the blowout trip of a lifetime. Sure, it might seem like a good idea now. But don’t forget: Financial aid ain’t free. You’ll have to pay it back, and then some, down the line since you’ll likely accrue interest. Luckily, there are ways to get your spring break on without breaking the bank… or fouling the party. Obviously, airfare can be a major component of your trip’s expense, so you stand to save a heap of cash by driving to your spring break town. And in case you’re worried #RoadTripLife would severely limit your destination options, take heart: You’d be surprised at how far $50 in gas can get you, especially if you split that cost four (or five) ways. Yes, it’ll probably take longer than flying. But spending time with your friends is the whole point, right? Bonus: You don’t have to pay for expensive airport snacks or worry about being stuck next to a crying baby. And if you take these tips on road tripping frugally, you might have quite a bit of leftover cash to spend at the beach bar. Here are our top spring break ideas that won’t blow your budget. Guess what beach TripAdvisor users rated the best in the country last year? That’s right: Clearwater Beach beat out heavyweight contenders like South Beach in Miami, San Diego’s fancy La Jolla and Coronado, and even — yup — every single beach Hawaii has to offer. Listen, I know there’s a lot to make fun of when it comes to Florida, but we’re clearly doing something right. If you decide to hit Clearwater Beach, be sure to have some fresh fish at Frenchy’s — it is legitimately famous for a reason. The original (or Buffalo, surprisingly enough) grouper sandwich is what you want, and it’ll cost you less than $15. And don’t forget to make your way down to St. Pete and wave hi to The Penny Hoarder crew! There are also some killer breweries, bars and eats in town. Florida’s First Coast is severely underrated. Jacksonville Beach has something for everyone: a serene spot for taking in the sunrise or grabbing a tan, a host of amazing restaurants (go to Taco Lu, get the Carne Royale, and thank me later) and a workable weekend bar scene for the bump-and-grind type. You just have to know where to look. Have someone in the car surf Yelp while you drive. Plus, world-famous Daytona Beach is just a little over an hour’s drive south, should you decide you just can’t do spring break without an iconic boardwalk experience. This is as far south in the mainland United States as you can get, so unless you’re already somewhere in Florida, it might make for quite the road trip. That said, other than the U.S. Virgin Islands and Puerto Rico, it’s also about as close to an exotic the Caribbean vacation as it gets without whipping out your passport. And, if you’re planning on coming as far south as Miami anyway, let this South Florida native tell you: The Keys, and Key West in particular, are well worth the extra few hours’ drive. The water is clearer, the people are more laid-back, and the traffic is nonexistent… not that you’ll be able to rip yourself out of the ocean for long enough to get behind the wheel! And although you could certainly blow your cash on one of the many luxury waterfront hotels that go for over $300 a night, you can also find private Airbnb rentals within walking distance of the beach for as low as $60. This resort city is famous for its amusement-park-bedecked boardwalk — so be careful. Those touristy areas are bound to be overpriced. 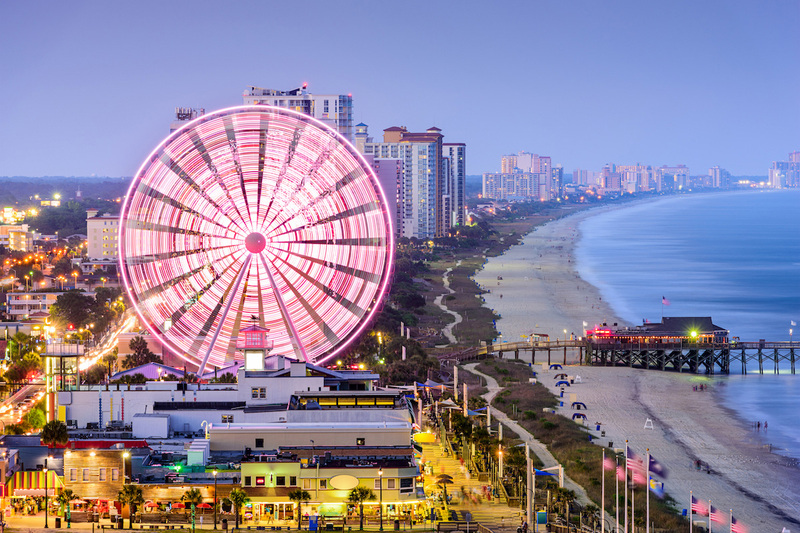 But Myrtle Beach just happens to be the central hub of more than 60 miles of pristine coastline, so you can no doubt find a less populated (but just as luxurious) place to party nearby! Situated on the Gulf of Mexico, Galveston’s a good pick if you run with a slightly less party-hearty crew. Although you can certainly create a hedonistic weekend by its Historic Pleasure Pier, complete with roller-coasters, a water park and cotton candy, you can also take a walk through the Moody Gardens Aquarium or peruse the Galveston Art Center. Time your trip right, and you can partake in the ArtWalk event the city holds every six weeks. Best of all? Even swankier digs are only about $150 per night, and you can easily find rooms for a fraction of that price. Yeehaw! Alright, if your heart is set on a wet, hot American party, this picturesque destination might not be for you. But if you want to explore historical lighthouses, take on watersports and state parks, and sample great seafood on the cheap, look no further than North Carolina’s famous set of barrier islands. This area is more quaint than rambunctious, what with its penchant for bird watching and creepy historical mysteries. And it probably won’t be make-you-sweat hot: Hatteras Island’s average high temperature is still just shy of 70 degrees Fahrenheit in April. I can attest to the magic of these windswept beaches, which feature water on both sides. Rent a cabin, bring a hoodie, and roast something over a campfire. You won’t be disappointed. Willing to think outside the dune? A weeklong break from school doesn’t have to send you running for the beaches. If you’re open to alternatives, here are a few additional spring break ideas. If you’re not totally sick of winter — or if you live in a hot-all-year area like me — you could take the weeklong opportunity to head to a different kind of resort. Tips up! Although skiing can quickly become an expensive venture, there are ways to make it more affordable. And if slopes are a lot closer than any beach, well, that’s a fantastic first step. If you live within driving distance of these natural wonders, by all means, take advantage of them! Go camping in Yellowstone or hiking in Arches. Heck, you have a whole week — why not take a tour of three or four of ’em? Absolutely gotta get warm as soon as possible? Understood — but it doesn’t necessarily mean you need a beach. Don’t call it a cop-out. For some of us, there is little as relaxing and restoring as turning off our phones and laptops, crawling under the covers and starting in on that heaping pile of books we’ve been meaning to read. Your Turn: What’s your favorite spring break destination? Jamie Cattanach (@jamiecattanach) is a writer whose work has been featured in the Ms. Magazine blog, The Write Life, Nashville Review, Word Riot and elsewhere. Her favorite spring break vacation was — you guessed it — staying home with a giant pile of books.